Oren's Money Saver: Discover it - 5% Cashback Online! * Earn 5% Cashback Bonus for online purchases from 10/1/13 (or the date on which you signed up, whichever is later) through 12/31/13, subject to a cap of $1500 in purchases. Offer does not apply to government products or services, education providers, utilities, or travel. Amounts that are not charged to your card during your online purchase will not qualify. These purchases must be made by 12/31/13. Purchases made using Near Field Communication (NFC), virtual wallets, or similar technology may not be eligible. If a purchase is coded for a category other than listed above, it will not qualify. Rewards are added to your Cashback Bonus account within 2 billing periods. See Cashback Bonus Program Terms and Conditions for further detail. Disclaimer: I receive a referral commission for the following link(s): Ebates, Discover offers are no longer valid. 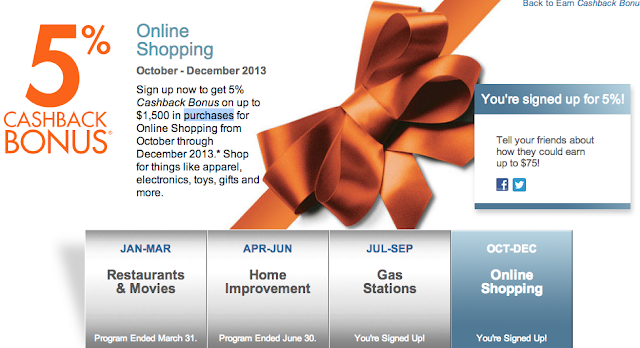 DISCOVER IT™'s upcoming 5% category is online shopping. I buy everything I can online for convenience and extra points so I'm pretty pumped. The maximum spending is $1,500 for the months of October, November and December. Here is one idea of how to maximize rewards if you can't spend the full $1,500 online. I haven't tried it myself and I won't until October starts so stay tuned. Gift Card Mall - You can buy 3 $500 Visa Gift Cards for $1,522.11 which is equal to 1.47% in fees. You won't get cashback for the extra fees, but the actual $1,500 should get you 1% cashback.